Couture Crush is an upscale women’s fashion boutique in downtown Clarksville, TN. They carry unique designer clothing from a variety of labels, as well as home decor, books, local art & stationary. Personally run by owner Kaley Drew, Couture Crush blends runway styles with traditional favorites to create a diverse fashion collection. 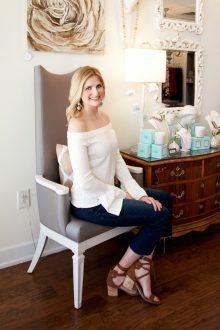 The stylish shop is located in Historic Downtown Clarksville. Brands you may find among the chic displays include 7 For All Mankind jeans, Judith March dresses and RYU performance apparel. New clothing and accessories arrive often, so you’re sure to find a new favorite piece each time you enter the store. What does Couture Crush mean? Kaley calls it “Fashion Infatuation.” A love of style, and a passion for beautiful things. A healthy preoccupation with clothing and accessories that beautify the wearer and intrigue the observer. Get fashion tips and expert style advice from Kaley on her fashion blog. “Like” Couture Crush on Facebook for a sneak peek at new arrivals, and visit our downtown Clarksville store to see the latest seasonal collection filled with bold colors and styles.